THE LAST PLACE I expected to see art by Tony Cragg and Jenny Holzer was in downtown Las Vegas. What was I thinking? The whole town is a global city of art—or, rather, artifice. Here’s the Eiffel Tower and the Statue of Liberty. There’s the Roman Forum, the Doges Palace, a castle for a latter-day King Arthur who gives you easy odds. Imagine a town where the most tasteful piece of architecture is a Trump International Hotel, and you understand what we were up against. Then again, the barrage of glitz is partly what inspired Rondinone to place Seven Magic Mountains—his biggest and brightest public artwork to date—among the snakes in the Mojave Desert, ten miles to the south. Left: Seven Magic Mountains consultant Sandra Fairchild with Bill Haase. Right: Art Production Fund director Casey Fremont with APF cofounders Doreen Remen and Yvonne Force Villareal. To make it happen, APF cofounders Yvonne Force Villareal and Doreen Remen practically had to move mountains of their own. From design to execution, the project took five years and required the cooperation of competing federal, state, and county agencies and the support of MGM Resorts. They also needed the engineering expertise of the Las Vegas Paving Corporation, which moved thirty-three forty-four-thousand-pound limestone boulders from their quarry to the site, hard by Jean Dry Lake, stacked them in pillars roughly thirty feet high, secured them to the land, and prepared the access road from I-15. Now the May 9 day of reckoning was here. Come cocktail hour, two hundred guests invited to a champagne reception by the APF and the Nevada Museum of Art, its producing partner in this scheme, would board tour buses from the Aria Resort and Casino to a half-acre of desert dotted with creosote and cactus. On the way, we passed a road sign that read, SEVEN MAGIC MOUNTAINS, NEXT EXIT. No clue to motorists whizzing by at 85 mph that it signaled art ahead, not another casino. Tiny spots of bright color appeared in the distance. Against the McCullough mountain range behind it, Rondinone’s stuttering line of hot pink, sea blue, pitch-black, sunset orange, blinding white, hard silver, grass green, chartreuse, and magenta totems looked a little like a leftover encampment from Burning Man—or fossilized visitors from a Planet Mardi Gras. “They’re way more phallic than they were small,” said Sadie Coles, referring to the domestically scaled “mountains” her gallery in London showed last fall. “I must tell Ugo.” Barbara Gladstone was more than pleased to be among them, if the broad smile that never left her face was any clue. Dealer Eva Presenhuber also came along for the ride, dressed in an orange blouse to match the boulders in that color. Never mind that the invitation had suggested white cocktail attire and “desert appropriate” footwear. NMA trustee Denise Cashman also arrived in a dress as pink as the stones, and platform sandals. Left: Artist Leo Villareal. Right: Dealers Simone Battisti, Sadie Coles, Barbara Gladstone, and Eva Presenhuber. “It’s even better and more beautiful than we expected,” said APF director Casey Fremont of the artworks, before mingling with Bellagio Gallery of Fine Art director Tarissa Tiberti, NMA trustee Bill Prezant, curator JoAnne Northrup, and Fremont’s parents, Shelly and Artnews CEO Vincent Fremont. “Isn’t this wonderful?” Fremont mère said. Actually, it was hot and windy, but once the sun began to set, the irradiated colors of the stones deepened and grew ever more luminescent. They really did seem magical, especially marooned out there in the brown desert. The dry lake has played a significant role in the history of contemporary art before. It not only was where Jean Tinguely and Niki de Saint Phalle exploded a sculpture in the 1960s but was also the spot where Michael Heizer dug two of his earliest works of Land art, in 1970, both now gone. Another piece of art history walked by in the shoes of Gianfranco Gorgoni, the photographer who documented all of Heizer’s work in Nevada, as well as art by the likes of Joseph Beuys, Richard Serra, Dan Flavin, and Walter De Maria. He was doing the same for Seven Magic Mountains. Out here in the desert, the avant-garde still lives. Ugo Rondinone’s Seven Magic Mountains. And back to town we went—to dinner at the Bardot Brasserie on the Aria’s mall-like mezzanine. Seven palm-size stones, each painted a color that Rondinone used on “7MM,” as people were calling it, were for sale at the door, discounted for the evening at five hundred dollars each. Beth Rudin DeWoody snapped up a complete set. Prior to this evening, the APF had scandalized some in the art world when it unleashed a Kickstarter campaign to raise money for the Rondinone project. The raised eyebrows asked why an artist represented by several blue-chip dealers, with numerous collectors around the world and the support of a museum, would need to elicit further donations from the public. 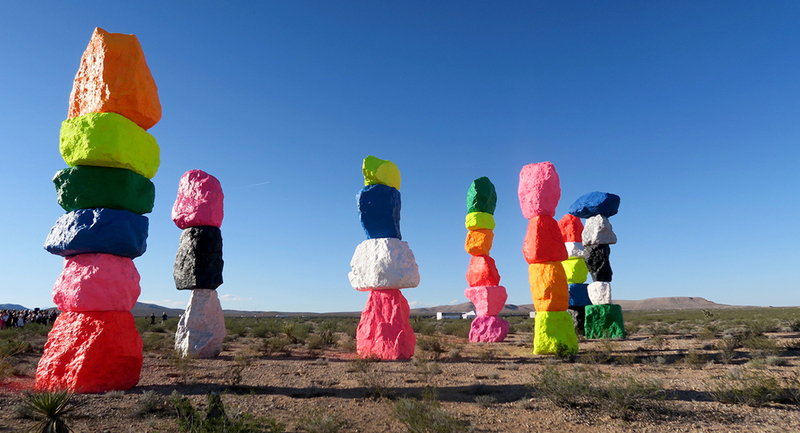 “First of all,” Force Villareal told me, “Kickstarter came to us and asked if they could feature Seven Magic Mountains on their platform.” The idea, she said, wasn’t to shame Rondinone’s gallerists or patrons, but to involve the local community and attract them to the site. “The response has been great,” she said, adding that the fifty thousand dollars Kickstarter brought in was a drop in the bucket of the $3.5 million total, including unsexy costs for permits, road improvements, carving, and engineering. The rest she raised privately, which wasn’t easy. “No naming rights!” she said. Donors were all around us. Members of the philanthropic VIA Art Fund had a table to themselves. So did the crew from Las Vegas Paving. I asked project manager Danny Fitzgerald how this job compared to his usual work. “It was the total opposite of what I normally do,” he sputtered. “Usually, I have to break up stones into little pieces, not bring boulders weighing forty-four thousand pounds down the road and pile them into towers! That was new.” Frankly, for a man who helped to build the wild fantasies of Las Vegas, it didn’t seem such a stretch. “It made me feel so happy!” exclaimed Sandra Fairchild, a consultant who had secured the permits from the Bureau of Land Management but was introduced to me as a former US Army soldier and a crack shot. “They don’t understand art,” she said of the BLM agents. “That’s partly why this took five years.” On the other hand, she added, art has been out there for millennia—in the form of petroglyphs, thousands of them, on the natural mountains beyond. If not for their non-glare, graffiti-resistant paint, Rondinone’s artwork might be seen as bringing coals to Newcastle. Not by him. “It’s like putting Land art together with Pop art,” he said. The following morning, for context, Craig-Martin and I went with Rondinone on a hunt for Double Negative, about ninety minutes away. His other half, poet John Giorno, was also in the SUV, with Presenhuber and her sister Gertrude. This was their second try. Two days earlier, with only a GPS signal for a guide, Rondinone had driven them around for hours and never come across it. Left: Land art site locator and Seven Magic Mountains project manager Count Guido Roberto Diero. Right: Nevada Museum of Art director and CEO David Walker. Double Negative isn’t on a map. It doesn’t send out signals. So this time, we headed out with explicit directions from the Museum of Contemporary Art in Los Angeles. (The museum owns the work, thanks to a gift from Virginia Dwan, the legendary dealer and collector who funded and bought the work originally.) MoCA director Philippe Vergne had assured me an easy-peasy time. We had a little trouble finding Mormon Mesa. It was harder to see the road leading to the site. Everything around us looked the same, so Rondinone drove with the rim of the Virgin River gorge in sight. “This is how many art people it takes to find a piece of Land art,” Craig-Martin said, as we went this way and that. But we were close and everyone knew it. I could feel Rondinone’s excitement. I had it too. And suddenly there it was, the northern cut—a rectangular gash extending down a sandy fifty-foot slope and leading out to the gap dividing it from its twin on the other side. “I can’t believe we made it!” Rondinone shouted, and down the slope we went, sliding into the cut, its formerly razor-straight walls now badly eroded, if Gorgoni’s 1970 photos are any indication. “You can see how he sliced them,” Giorno said, looking down from above. The structure and the colors of the stone were almost ornate. “I’m glad we came,” Rondinone said, “but the point is really about finding it.” He spoke too soon. We still had to get back to Vegas. Probably it wasn’t a great idea to try this kind of thing in the noonday sun. The ignition locked. This is how many art people it takes to start a car, I thought, while Giorno tinkered and the rest of us baked. Finally, the engine came to life and off we went—until, out of nowhere, the gorge loomed into view, and we had a six-alarm shriek of a Thelma & Louise moment, with a narrow escape that I’ll never forget. Land art is amazing. The scale. The beauty. The audacity. No wonder Rondinone wanted to take part in this tradition. “Goodbye, Double Negative,” he called out. “You brought a lot of joy today.” ’Nuff said. 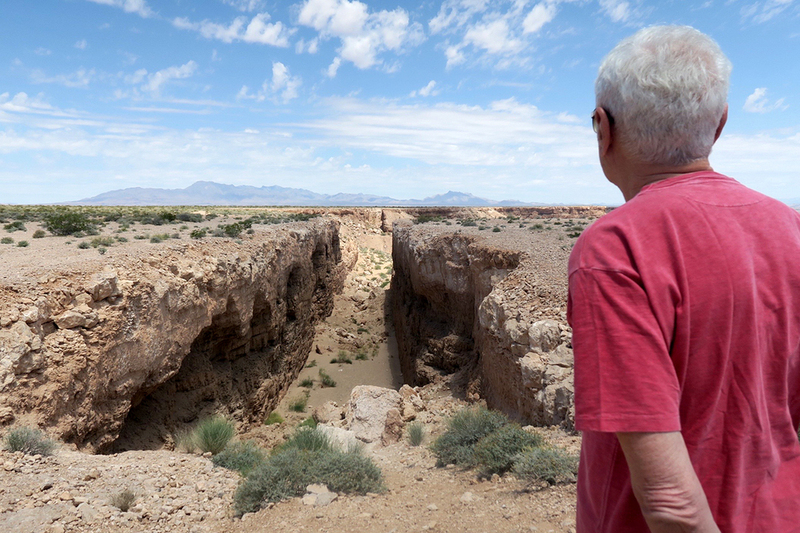 Poet and artist John Giorno at Michael Heizer’s Double Negative. Left: Collectors Shelly Fremont and Robert Lococo. Right: Las Vegas Paving Corporation project manager Danny Fitzgerald and APF director Casey Fremont. Left: Nevada Museum of Art trustee Denise Cashman and publicist Ali Cashman. Right: Public Art Fund director Nicholas Baume. Left: The Cultivist cofounder Marlies Verhoeven and artist Yassi Mazandi. Right: Bass Museum director Silva Carmen Cubiña.